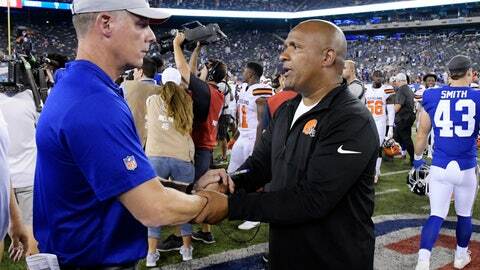 EAST RUTHERFORD, N.J. (AP) — The additions of new coach Pat Shurmur and No. 2 overall draft pick Saquon Barkley didn’t provide a quick fix for the New York Giants‘ offense. The offense generated 10 points, with the lone touchdown being set up in the third quarter by a recovery of a fumbled punt at the Browns 14 by Zak DeOssie. Aldrick Rosas‘ 42-yard field goal on the opening drive was ignited by a 39-yard run by Barkley on the first play from scrimmage. The drive was kept alive by an unsportsmanlike penalty on Cleveland rookie Denzel Ward after a third-down incompletion.